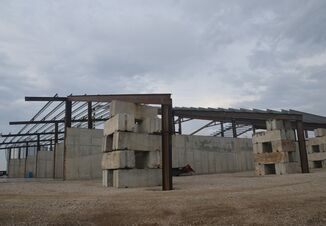 A new manure processing system installed at Son-Bow Farms will save an estimated $1.80/cwt. Jay Richardson is a cost accountant by training. Four years ago, he knew he had to change some things on the 1,400-cow Son-Bow Farms dairy he co-owns or the operation would soon no longer be sustainable. Richardson dairies near Maiden Rock, Wis. Because the landscape is untouched by glaciers, the topography of the land just east of the Mississippi rolls and twists steeply in and out of the ancient valleys. Fields ae small, yet competition for farmland is intense because this area is dense with dairy cows. Richardson farms 2,400 acres spread out over 30 miles. 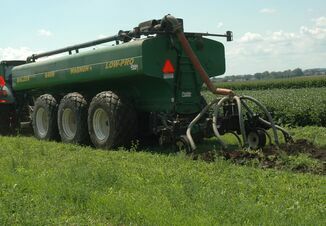 “If we put manure on wheels, it’s costing us 2 1/2¢/gal,” he says. 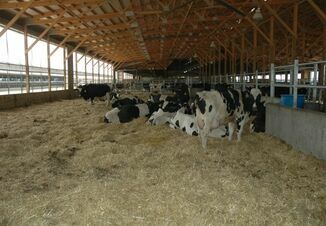 He looked at various options, knowing he wanted to stay with sand bedding for both cow comfort and milk quality. But the process to reclaim sand, separate manure solids and concentrate nutrients is no easy job. Richardson’s settled on a two-pronged solution, that uses both mechanical sand separation and drum composting of solids, and then both ultrafiltration (UF) and reverse osmosis (RO) to concentrate nutrients down to about a two-thirds of their original volume. The solids part of the system is like most such systems, relying on conventional sand and manure solid separation. Given the volume of material separated, Richardson uses two large drum composters to ensure solids are in the drums 48 hours to ensure bacterial kill. The compost is sold to a local vendor for soil inoculants. The liquid portion of manure is then pumped to the water building where it goes through a system that uses both UF and RO processes. Phase One sends centrate through the UF developed by Aqua Innovations, and separates the liquid into two streams. The first stream, an intermediate “teawater,” is held for further processing the RO system. The second product is a highly concentrated liquid that partitions about 95% of the phosphorus into about a third of the original volume. This UF concentrate is then sent to the lagoon for use as fertilizer. The teawater is further processed through the RO system to generate two more end products. The first has about 1 to 2% of the phosphorus of the original manure volume while retaining the nitrogen and potassium in the manure liquid. This “Super Teawater” is about a third of the volume of the original concentrate volume. The second and final end product is purified water that can be safely discharged directly to the environment. And because it’s almost the purity of distilled water with no minerals present, it will be discharged onto fields or into a waterway and not re-used for cattle drinking water. While the entire process is capital intense and will take about $3,000 of Phase 3 power per month, Richardson estimates it will eliminate some 1,500 loads of manure that won’t have to hauled annually. “At $200 per load, that adds up in a hurry,” he says. The concentrated nutrients mean he’ll also have to spread just 7,000 to 8,000 gallons of manure liquids to raise an acre of corn. With the old system, he had to spread 25,000 to 30,000 gallons per acre. He’ll also be purchasing about 90% less sand each year, and will have composted solids sales to help offset some of the operational expense of the manure system. The bottom line: Richardson believes he’ll save $1.80/cwt of milk sold even with the capital cost of the manure system included.